would love to win this. 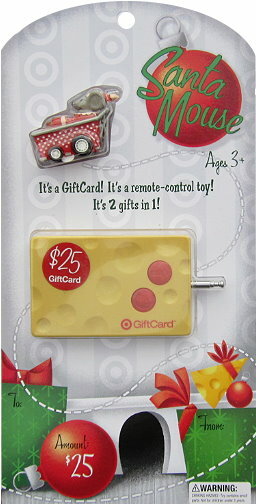 My son would love the remote toy mouse. I like you already on facebook….have for awhile now! How awesome! I would love this! 🙂 Thanks!! This is a cute gift card! Totally great giveaway right before Christmas! FREE GIFT CARD, HERE I COME!!!! This is the 1st time I am visiting your page as I just found it! Thanks for the tips! They are all awesome! OMG – I would love to win this! Totally Target has become my new BFF! Totally Target is one of my favorite coupon blogs. Thanks for another great chance to win one of your cool prizes! Merry Christmas! I love totally target! Thanks for the awesome contest!! I’m so exited!